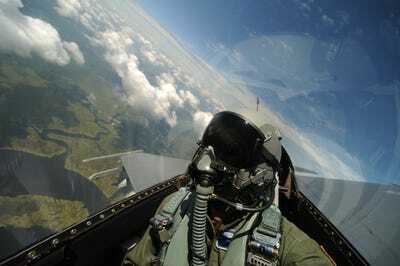 Few people get to experience the amazing rush, and have the incredible view, that pilots with the US Air Force are able to experience. 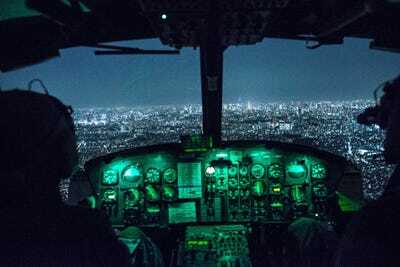 The following pictures take us inside the cockpits of the US Air Force. 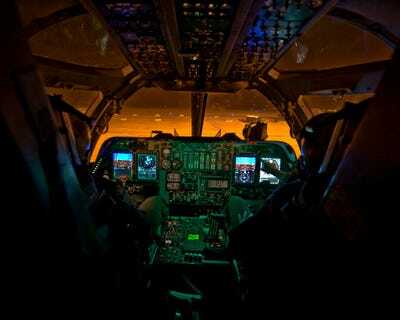 US Air Force Maj. James Silva, left, and Lt. Col. Steven Myers, both B-1B Lancer pilots, complete a flight in the first newly upgraded operational B1-B Lancer January 21, 2014, at Dyess Air Force Base, Texas. First Lt. Greg Johnston and Capt. 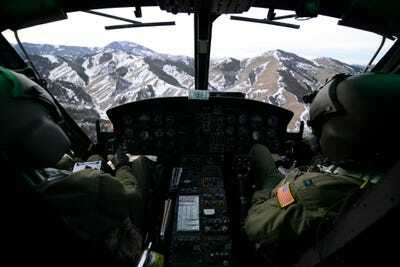 RJ Bergman fly their UH-1N Iroquois over a mountain range January 27, 2015, near Malmstrom Air Force Base. 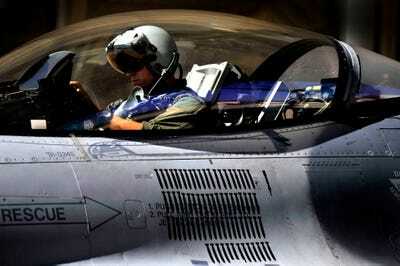 A US Air Force F-16 Fighting Falcon pilot with the 77th Fighter Squadron (FS) settles into his cockpit before takeoff, October 5, 2011, from Shaw Air Force Base. 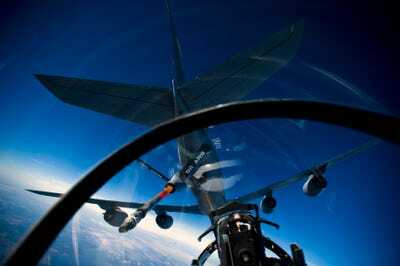 A US Air Force KC-135 Stratotanker aerial refuelling aircraft connects with a Belgian F-16 Fighting Falcon fighter aircraft August 18, 2011, during aerial refuelling over Afghanistan. Staff Sgt. 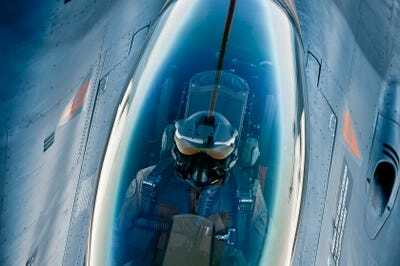 Michael Keller takes a self portrait in an F-15E Strike Eagle during a local training mission over North Carolina, December 17, 2010. 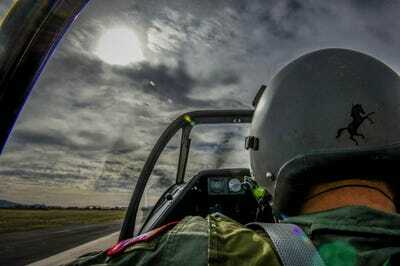 Vlado Lenoch, a pilot with Air Combat Command's Heritage Flight program, taxis the runway at Davis-Monthan Air Force Base on March 5, 2016. Lenoch and his P-51Mustang participated in Air Combat Command's Heritage Flight Training Course, a program that features modern fighter/attack aircraft flying alongside Word War II, Korean War, and Vietnam War-ear aircraft. 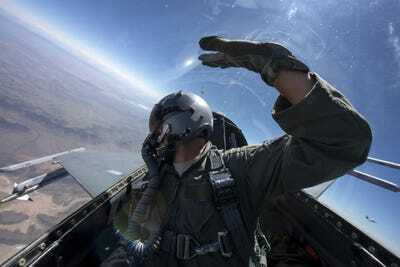 F-16 Fighting Falcons from the Arizona Air National Guard's 162nd Wing fly an air-to-air training mission against student pilots April 8, 2015. A US Air Force F-15E Strike Eagle aircraft from the 335th Fighter Squadron approaches a 911th Air Refuelling Squadron KC-135R Stratotanker over North Carolina during a local training mission, December 17, 2010. US Air Force Technical Sgt. 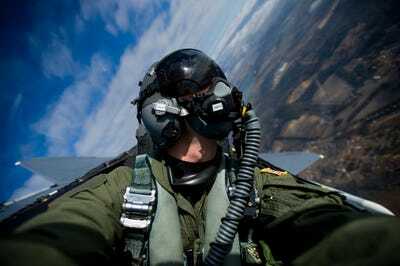 James L. Harper Jr., aerial combat photographer, 1st Combat Camera Squadron, Charleston Air Force Base, South Carolina, takes a self portrait during a training mission with the 119th Fighter Squadron, New Jersey Air National Guard on August 19, 2009 over the Atlantic Ocean. 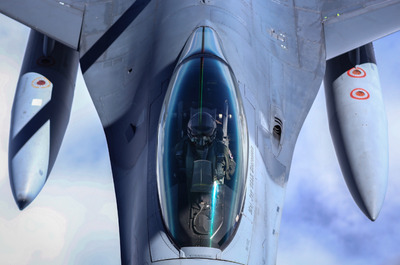 A US Air Force F-16 aerially refuels from a KC-135 Stratotanker.